For westerners, stuffing typically consists of bread and veggies, but for Vietnamese, stuffing means ground pork, bean thread noodles, and woodear mushrooms. This classic pork stuffing is the basis for egg rolls, steamed pork egg custard (cha chung hap), canh kho qua (bittermellon soup), and ca chua nhoi thit (stuffed tomatoes). Even for Thanksgiving, our turkey was stuffed with this mixture. 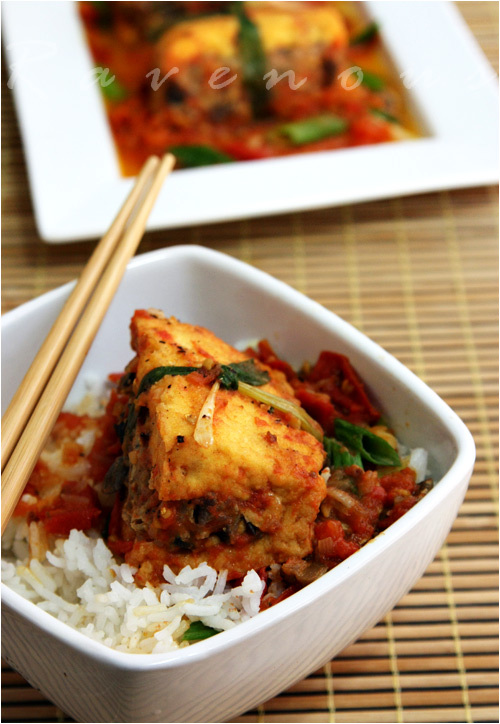 Here we present another classic Vietnamese home cooked dish, dau hu nhoi thit, braised stuffed tofu with tomatoes. This stuffing is so easy to make and yet so versatile. 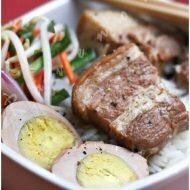 Master this magical pork mixture and you’re opening your kitchen to many authentic Vietnamese home cooked dishes. In a large mixing bowl, mix together the pork, fish sauce, sugar, pepper, salt, shallots, wood ear mushrooms, bean thread noodles and mix well. Slice the tofu lengthwise along the side, but do not cut all the way through. Gently split tofu open and stuff it, being careful not to over stuff and rip the tofu apart. Microwave the green stems for about 10 seconds or dip them in boiling water to wilt. Then wrap the tofu like presents with a double knot. If you can make a nice bow, go for it!! In large saute pan or wok add about 1 tbs of cooking oil on medium high heat and when hot, add garlic and shallots. 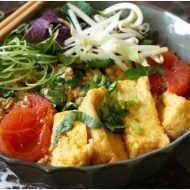 When fragrant and golden, add the tofu and tomatoes. Now add enough water or stock (chicken) to just cover the tofu. Close lid and braise on low heat for about 30 minutes or until the tomato sauce is reduced and thickened. Adjust seasoning of the tomato sauce with salt and pepper and finally add the chopped green onions. Remove from heat and serve with jasmine rice. By braising, the pork and tofu will soak in the tomato flavor. Your family will love this–each stuffed tofu is like a delectable present that your family will be happy to enjoy over and over. Tung: you're always hungry though! TofuCustard: Do make it and let us know..post it on our Facebook fanpage! Looks beautiful. . .what a great way to fancy up tofu, which tends to be "homey." roxan: wished we had left overs! This looks great! I assume it's firm tofu that you're using? Wow! I love learning these things! Yum! This is one of my favourite dish! I love how you tie everything together with the green onion. I would love to make this with our supper club~ so elegant. Nice that you can get everything prepped and ready to braise ahead of time. I taste the sweet and savory flavors of the tomatoes and ground pork excellent of a bowl of hot steamy rice! Looks so good! Eddie: Yes, the large firm and pre fried tofu works best for stuffing. These are commonly found in any Asian market. Joy: Glad you enjoy learning about Vietnamese food…perhaps you can make something and post of for Delicious Vietnam! Anh: It's a favorite in our household too. Dave: thanks! The tying it with the green onion just adds that special touch. Debi: We'll be honored if you make this with your supper club! Bao: Dau hu nhoi thit does have a great combination of flavors..Thanks! Beautiful presentation! All your pics literally scream 'Eat me!' Makes me want to consider eating pork again…but then I shake myself out of my drool-excited state. I also loved the comparison about the stuffing. 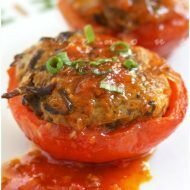 What would you suggest as a substitute for tomatoes? Will oyster sauce work? Tuty: try any type of squash or egg plant..or even red/orange bell peppers..you can even try pureeing it first. Oh yes, this would hit the spot. thanks for sharing this recipe! funny thing is that i have also used a pork mixture in everything you listed, even our thanksgiving turkey too! can't wait to try it with tofu. that's a nice touch with the green onion wrapping the tofu! you guys are making me hungry!! The Yong Tau Foo dish we get in Malaysia/Singapore has this item where the tofu is stuffed with fish paste. When made at home, sometimes the stuffing becomes a mixture of ground meat + fish paste. The Viet version is new to me. Thanks for sharing. Never heard of this (okay I'm not that familiar with Vietnamese cuisine! ), but it looks and sounds super flavourful. This is definitely going on my to-make list. My mom makes a shrimp stuffed tofu (Chinese style) and it's so fascinating to me how similar, yet so different our cuisines are. This looks so so delicious to me. I've stuffed hollowed out bitter melons with this mixture for steaming. Cheated just a bit by adding a bit of garlic/black bean paste because I'm Cantonese- American. Was in Vietnam 2 years ago and loved every minute of it. I have never seen such lovely braised tofu. Looks fabulous and delicious. I would be very happy to have just that with rice 😀 Beautiful photos! Have a lovely weekend. I love this one as well. Gotta spoon that sauce over the rice! Purdy shots. OMG, how did you do the tying so neatly?! 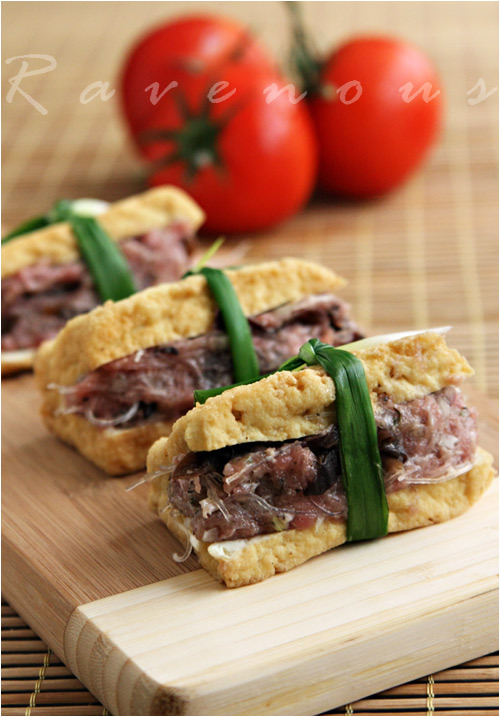 It makes a HUGE difference to the entire dish … looks so fine dining, even though it's hearty and homely fare. Well done! PS: Noticed the Saveur link. Congrats! Oh, I've never seen stuffed tofu. This is fabulous. thank you everyone for your comments! it's been a busy weekend for both of us! This reminds me of something I had in Taiwan but that one has much more noodles. I like the idea of adding noodles to the stuffing, I have to try this! Very nice! This dish wasn't in Mommy's repertoire, but it sure looks excellent! how beautiful, I love the green onion tie! looks delicious, fried tofu is one of my favorites and your stuffing sounds great. This dish looks terrific. 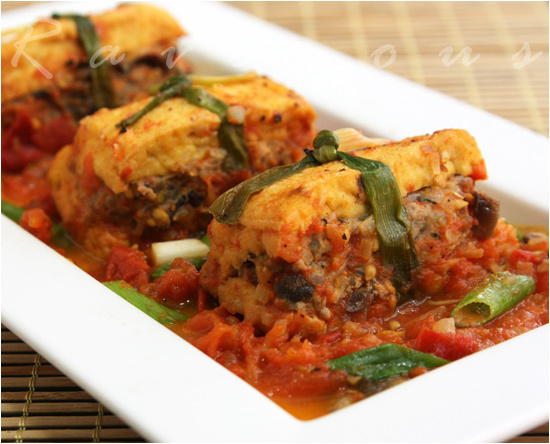 I love the idea of stuffed tofu. Thank you for sharing this. I love stuffed tofu! This looks great!